It was time to leave California today. The first stop on the way out was at Trader Joe's in Riverside to pick up a couple of cases of two buck chuck wine. While there I noticed Trader Joe's has their own brand of 100% agave Tequila (reposado). So, I also grabbed a couple of bottles to try it out. 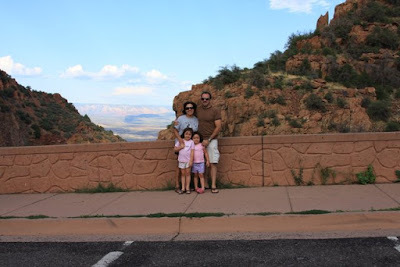 We made good time until we left the freeway in Arizona to take the scenic route toward Sedona. Right before leaving California we made a pit stop in Blythe. Do not stop in this town. It is the most expensive place....gas was 40 cents higher than anywhere else in Cali...even the McDonald's food items were about 25% higher across the menu board. Side note - I hate McDonald's, in fact, we all do but, I think it is impossible to take a road trip and not eat there. They are more prevalent than Starbuck's. In fact, heading out on road trips we always pack sack lunches. In Prescott we made our final visit to In-n-Out. I ordered a single cheeseburger and well done fries, both 'animal style.' Good stuff. 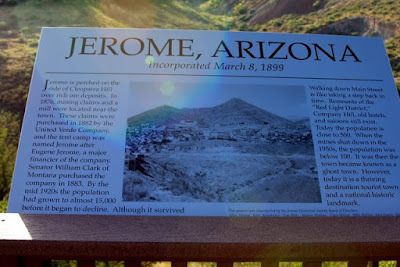 In the middle of all of these winding canyon roads was the town Jerome, built, literally, right into the side of the canyon. The road through this town actually consist of several switchbacks. 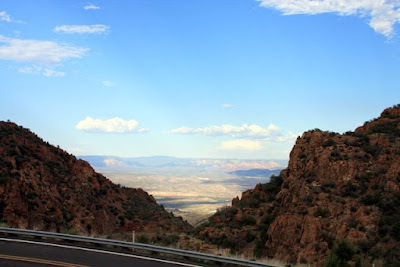 As we drove into Sedona we were amazed at the beauty of red rock formations. More photos later. We made a last minute decision to make the 30 mile drive up to Flagstaff to visit the Lowell Observatory. Little did I realize that this 30 mile trip involved a drive through Oak Creek Canyon....one super winding road. And, we made this trip at night. The observatory was great and, even the girls enjoyed it. All of us got to look at Jupiter using the 24" refracting telescope. We didn't get to see the Red Dot since it was on the other side. We also had a chance to view the moon on a small 10" reflecting telescope. The observatory also had a very interesting exhibit hall. We did run out of time in the exhibits since they closed at 10pm. 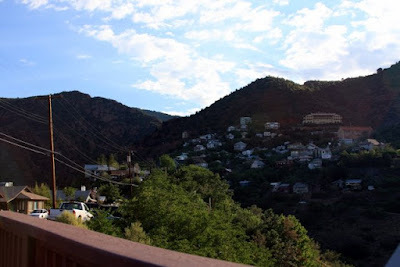 We then had to make the drive back to Sedona through Oak Creek Canyon. This time the drive didn't seem nearly as long.